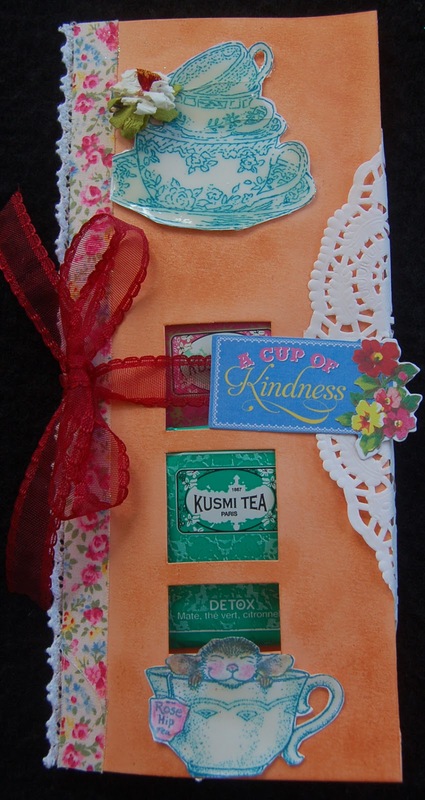 On a recent trip I purchased some fancy tea bags to put in tea folders/cards. Normally, I buy loose tea because it is more economical but tea in little bags are convenient for mailing and are more attractive too. I decided that the Big Pro Sizzix die that cuts a long card with three windows would be perfect for making a tea folder. If you don't have a Big Pro machine, you can check with Ben Franklin Crafts and they might have the die for you to use if you buy paper from the store. Also the three window part of the die is really a magnetic piece that can be used with other dies with openings to accommodate it. Anyway, I used some tea cup themed stamps from my collection. I stamped with blue Memento ink and colored the images with watercolor pencils. The mouse one is from House Mouse Designs.....not sure if this company still exists. To make the cups more realistic I applied Crystal Lacquer over them. 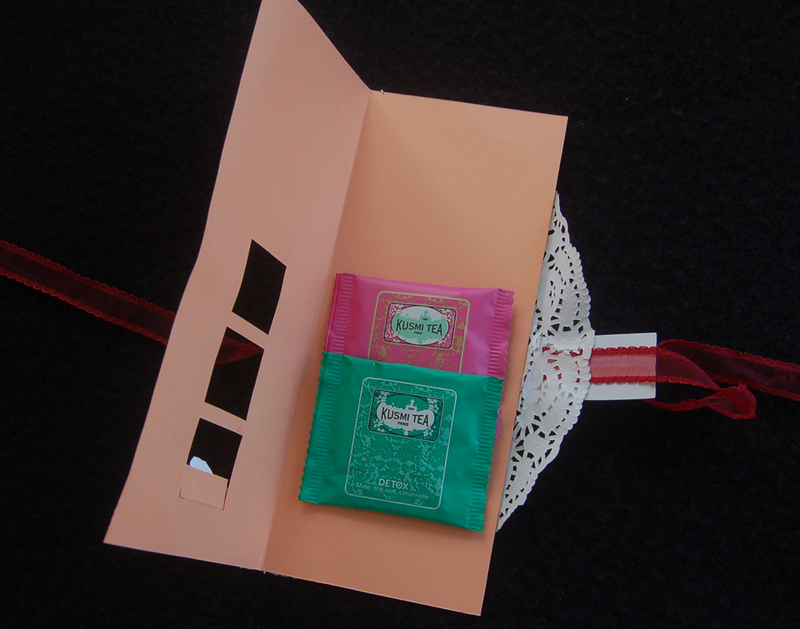 The tea bag packets were attached with Merikan double stick tape. The folder was further embellished with part of a paper doily, ribbon (from the red tag sale), and fabric tape (notice how the lace on the back peeks out in the front. By having a tie closure, the folder holds the tea bags and doesn't flap open. So what about the giveaway? If you would like to win this tea folder and tea (plus some other goodies), just be the first to comment and leave a guess about the name of the city where I purchased the tea. (There is a hint in the photos.) If you win, you will have to send me your real name and mailing address. We'll correspond by email so no one will see your address and name. Good luck to all.......I hope YOU are the first to send me the correct city name! Wow! Niki (Stampn'HI ) was the speedy one who correctly guessed that I was in Paris, France buying tea. Congratulations Niki! On Sunday I went to Ben Franklin Crafts in Hilo to purchase a picture frame and the Sister Stamp with the panda bear. I was elated to find out that the store was having a 50% off red tag sale. Yes, all the red tag items in the store (items already reduced substantially) were marked an additional 50% off! What was even more exciting was there was an entire long table of baskets (in the back of the store) with fabulous items red tagged! The photo shows just some of the great red tag items I found. 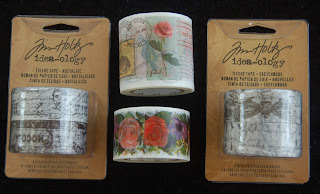 There were lovely packs of printed papers even from the Tim Holtz line. As a hoarder of stamps, I was thrilled to find great sets of brand name stamps. 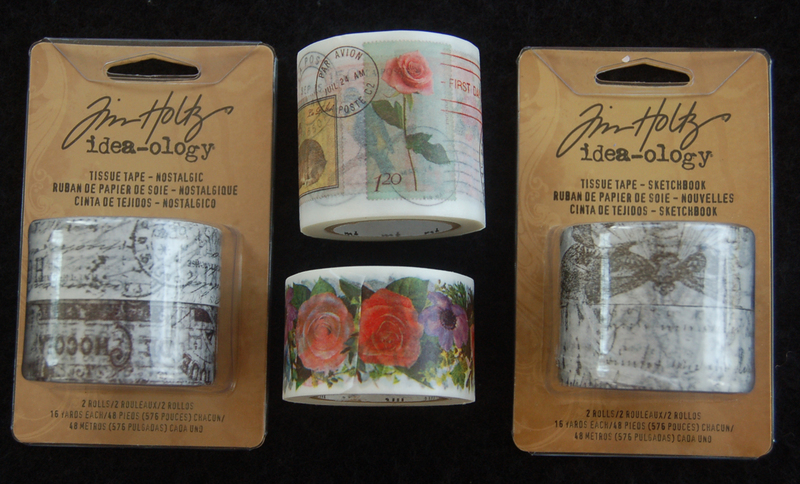 Also in the loot were ribbons, stickers, embellishments and lots of Tim Holtz products that I've never seen before. I believe lots of the red tag items are samples sent to our buyers and although great, were not chosen for sale in our stores. What I found was just from the Hilo BFC, but I think the other Ben Franklin Craft stores are also having 50% off red tag clearance sales, too. Oh, and don't forget that if you are a craft club member you get an additional 10% off from the sale price! This means that you save even more. I think almost all of the items I bought were priced only $5 or less and many of the prices were 50 cents or a dollar! You have to check out this sale which I believe lasts until this weekend, but you should hurry as the traffic around the sale baskets was quite brisk. Don't forget to check all around for red tagged items as there are many bargains throughout the store. Okay, that's it....go shop now! 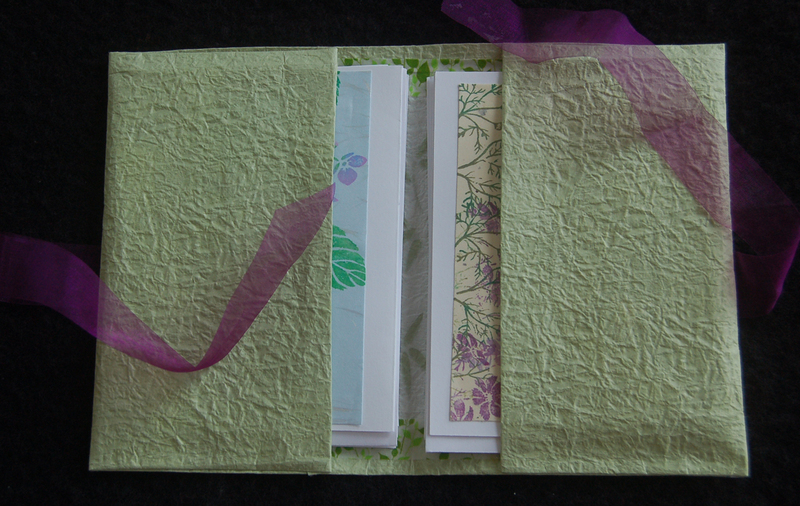 I know most of you think that I am going to write about the practice of giving someone a gift that someone else had given you, but this blog is about a gift I made for the person who gave me the gift of a jumbo booklet of Japanese sample papers. (See lower photo.) 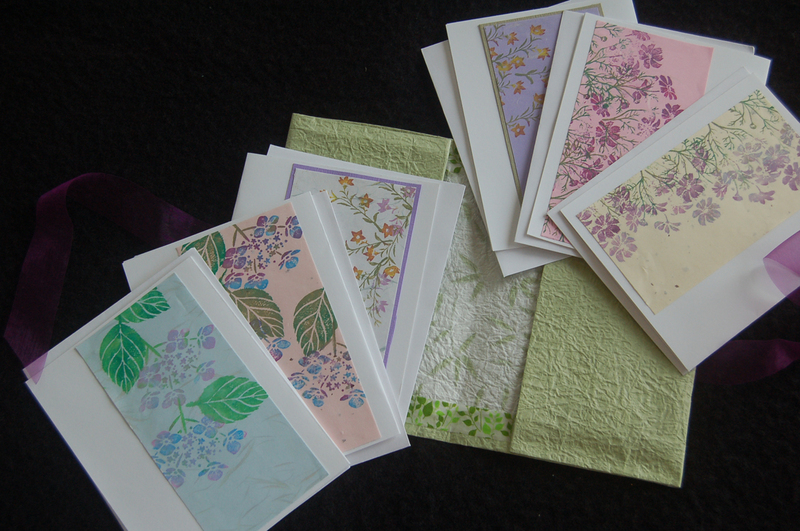 My friend had intended to use the paper samples to make some handmade crafts but said she didn't think she ever would so she generously gave them to me. I was so happy with the freebie that I had to make her something from the papers so she would know how much I loved her gift. These photos show what I created for her. Because the papers were Japanese, I decided to keep with the Japanese feel and do simple 'woodblock style' printing using my Hanko and Kodomo No Kao stamps. (These stamps were purchased a long time ago from Ben Franklin Craft but there are probably similar ones on sale there now.) Those of you who are familiar with Japanese greeting cards know that they often are very subdued with just a strip of printed paper on a solid colored card. By using Duo Dauber and Dew Drop ink pads (Tsukineko) I was able to color just certain areas of each stamp to print multi-colored images. 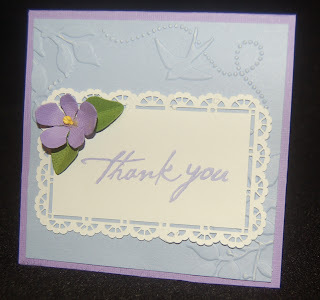 I spritzed the inked stamps with water just before stamping to give a slight watercolor look. I think BFC still sells these small sized ink pads that are just perfect for this technique. Remember that you can just ink some parts of the stamps to apply more flowers or leaves where you want them and to give each card a unique look. 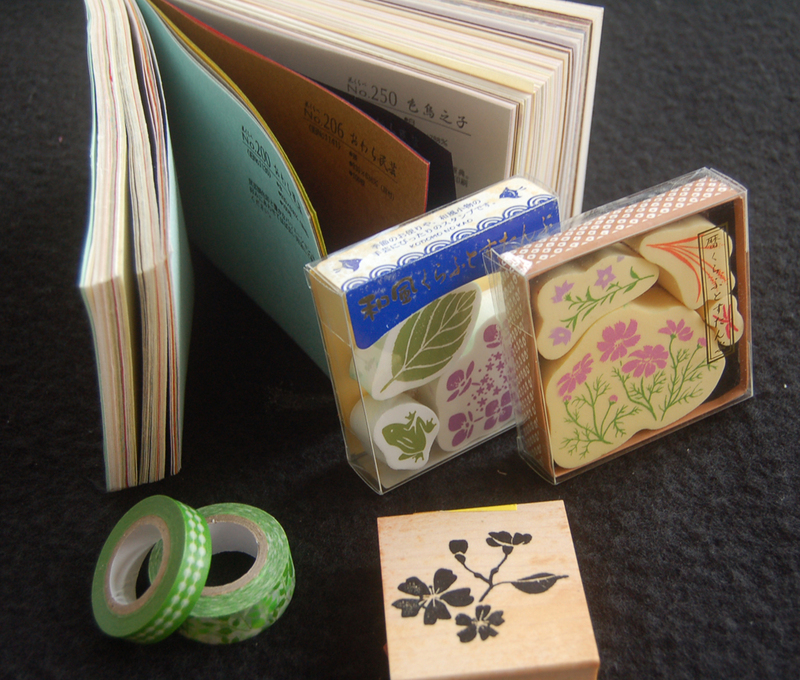 This photo shows the sample paper booklet I was given and the stamps I used. The washi tape was used to cover up the fact that I cut the paper for the folder a bit short so it was 'washi tape to the rescue'! Oh, the folder was made simply by folding some thick textured paper around the cards to determine the size...no real measuring needed. The whole folder was put together with double stick Merikan tape. Don't forget to allow for the thickness of the set of cards....my mistake that required the use of a washi tape repair. 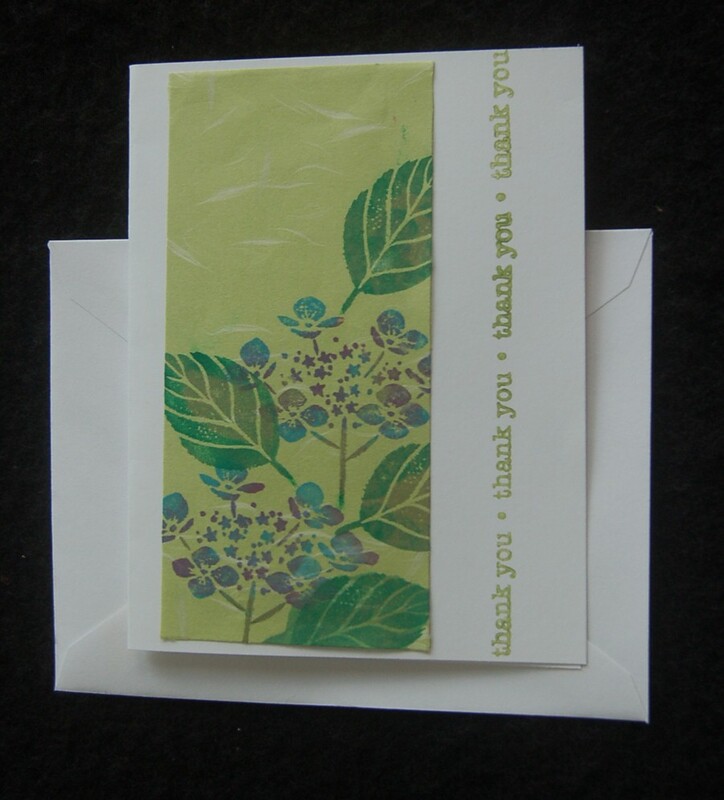 This last photo is of a card I made to go with the gift card set. 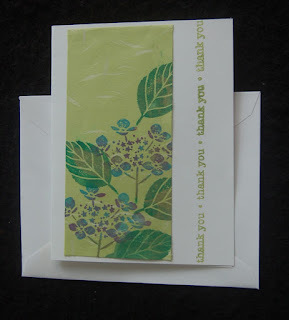 I stamped words on my card to show my friend what she could do to adapt each card for the purpose she intends. Well, I guess this post is long enough....hope you weren't bored and learned something that you might like to try. Winner Alert! I am happy to announce that Shirl (Creations by Shirl) is the winner of my random commenter non-contest contest. Every once in awhile I choose a name from the commenters to my blog for a certain month. Even though I've been traveling and not commenting on other blogs, my faithful blogland friends have still continued to comment so I decided to reward them by choosing one of them from the month of May. Congratulations Shirl, you have won a $25 gift card to BFC plus some other crafty goodies. Thank you to all who read my blog. Please continue to do so and leave an occasional comment if you have the time because you never know; you maybe the next winner (each comment = one entry to the uncontest). If I didn't tell you, would you know that this box was decorated with washi tape? By varying the width and colors of the tapes I was able to create a pleasing look with very little effort. I started by die cutting kraft colored textured card stock with the matchbox with the Sizzix Big Pro die. Before assembling the box I applied the washi tape to the rectangular piece that would eventually be formed into the outer part of the box. Like a the design of a ribbon quilt of yesteryear, the tapes were run diagonally and then perpendicularly to those strips and perpendicular to those strips and so on until the whole piece was covered. Don't worry, washi tape is very forgiving and can be removed and reapplied countless times until you are satisfied with the resulting design. Inspiration for this project came from crafts seen at the Japan Hobby Show and the latest issue of the Somerset Life magazine. I used the Sizzix matchbox Big Pro die for the base. (If you don't have access to this die, try asking at Ben Franklin Crafts. If they have the die for store use, you can use the machine and die for free if you buy your paper from the store. If not, you may be able to work out a deal where you buy the die from BFC and use the store machine. This is would be great if you are doing multiple (hundreds?) favors for a wedding or big party. Anyway, after cutting the pieces for the box (from lightly textured card stock), I lightly creased the form and stamped my images on the flattened outside of the matchbox. The stamps I used were from Rubber Baby Buggy Bumpers (Degas ballet dancer), Inkadinkado (dancer and architecture), and clear sets by Tim Holtz and Hero Arts. Using double stick Merikan tape I assembled the matchbox. 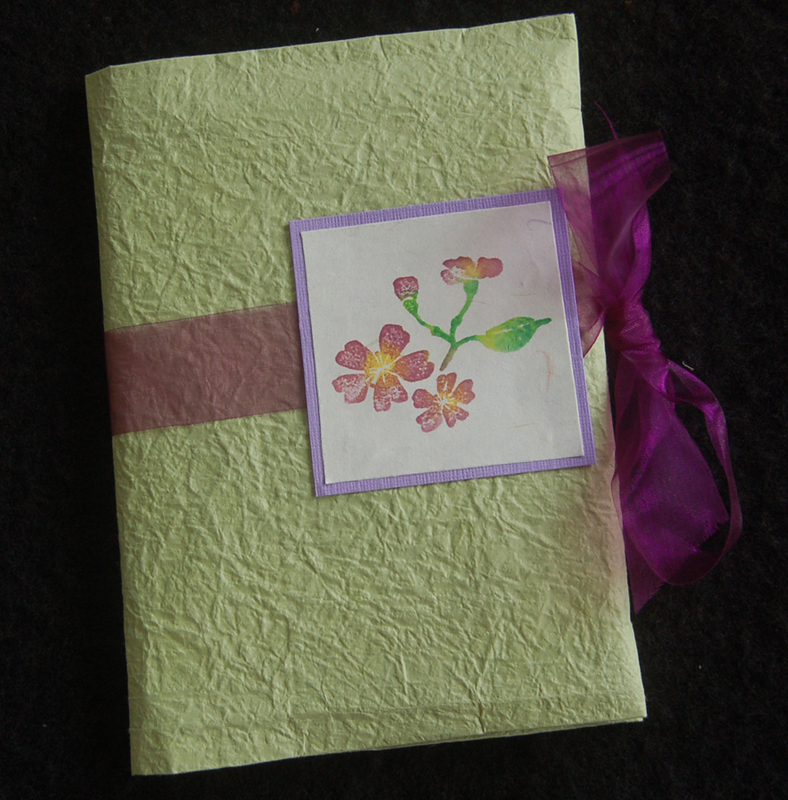 Next I used the Sizzix rose dies on pink and green textured card stock. I formed the petals, caylx and leaves using McGill tools and mat. Both double stick tape and glue were used to assemble the rose. 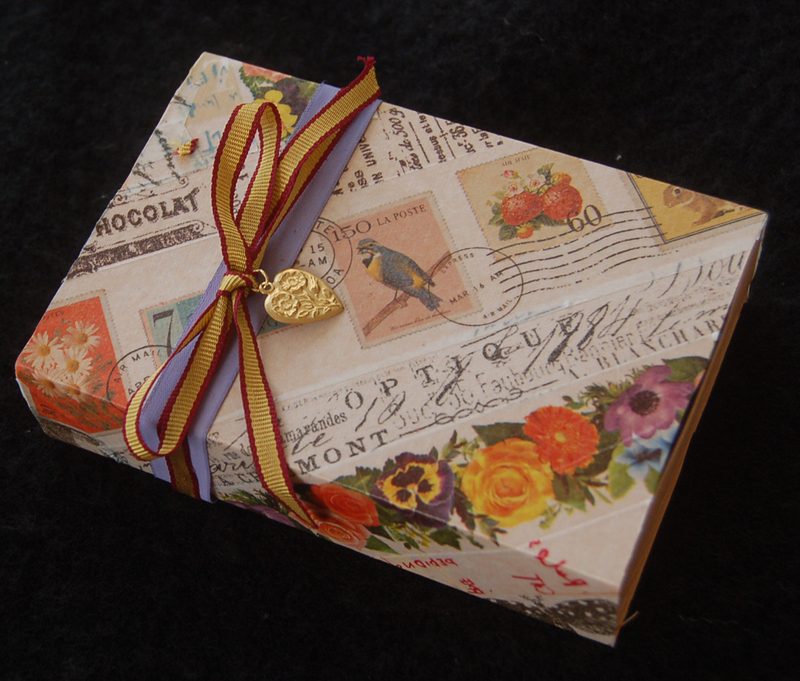 Natural twill tape and a thin ribbon were tied around the box after a swatch of fabric was glued down. 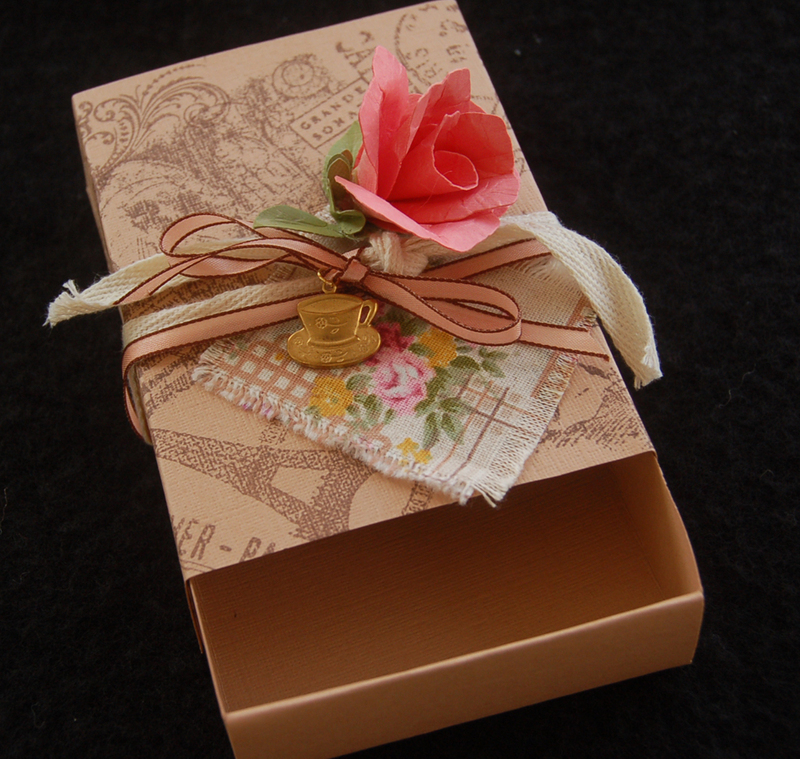 Lastly, the rose was glued into position and the charm was added with a jump ring. Can you guess what I plan to put in the gift box? 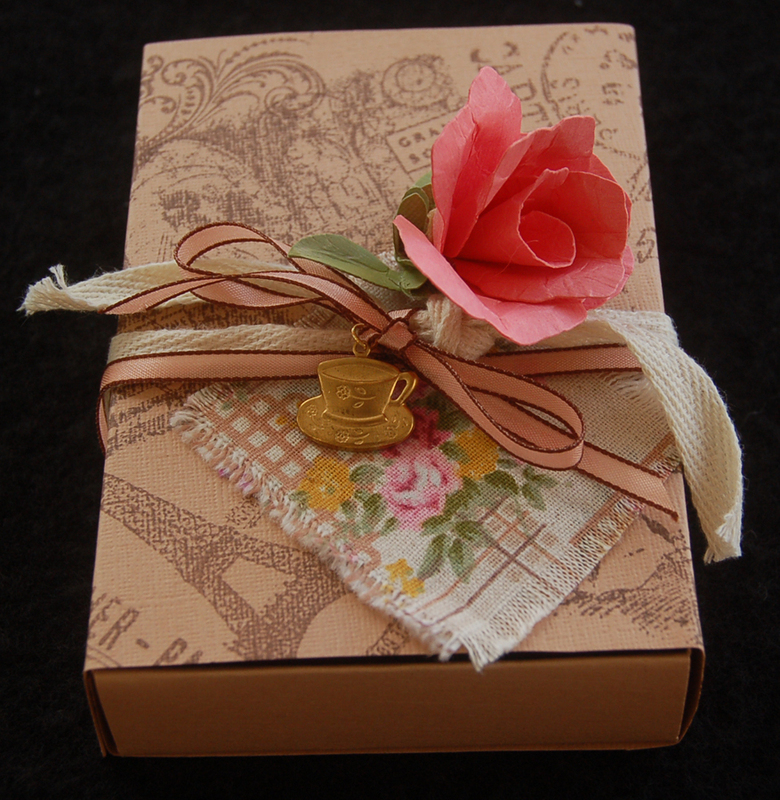 I thought some fancy tea bags would make a great hostess gift. 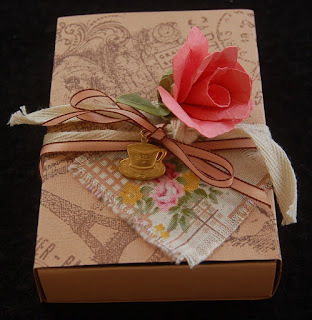 Perhaps I'll put some guest soaps in the matchbox and leave it as a sweet welcome gift for a house guest. 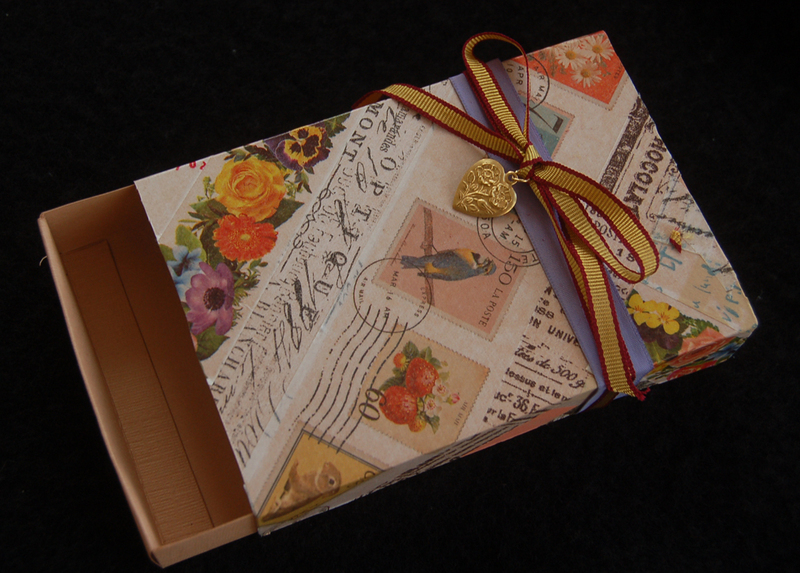 I hope this post has given you some inspiration for crafting to make your world more lovely. In the end it is not how much we own or earn, but how we treat one another. Be good to others and yourself! I'm not the gardening type, but I do love flowers. 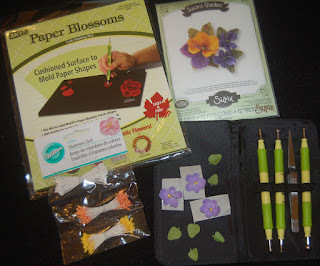 The new Sizzix flower dies are perfect for me because they allow me to feel like I am growing my own blossoms but I don't need to get my hands dirty LOL! With just the tiniest bits of scrap textured card stock, you can create these realistic flowers. The small card in the above photo used a piece of Sizzix embossed card stock, an Eclipse (I think) cut lacy placecard, and just a single violet blossom added for the perfect Victorian-look touch. 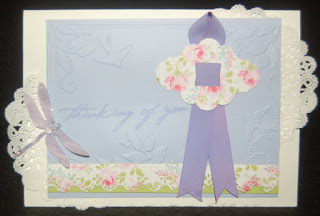 To shape the blossom I used the McGill tools and embossing pad. I do believe the Sizzix has a system too. The inner yellow pip was cut from a Wilton stamen package (used for cake decorating). Using a large glue dot as a base made adhering the petals simple. Under the petals stuck to the glue dot is a die cut and embossed calyx, which forms a cup to hold the glue for the petals. 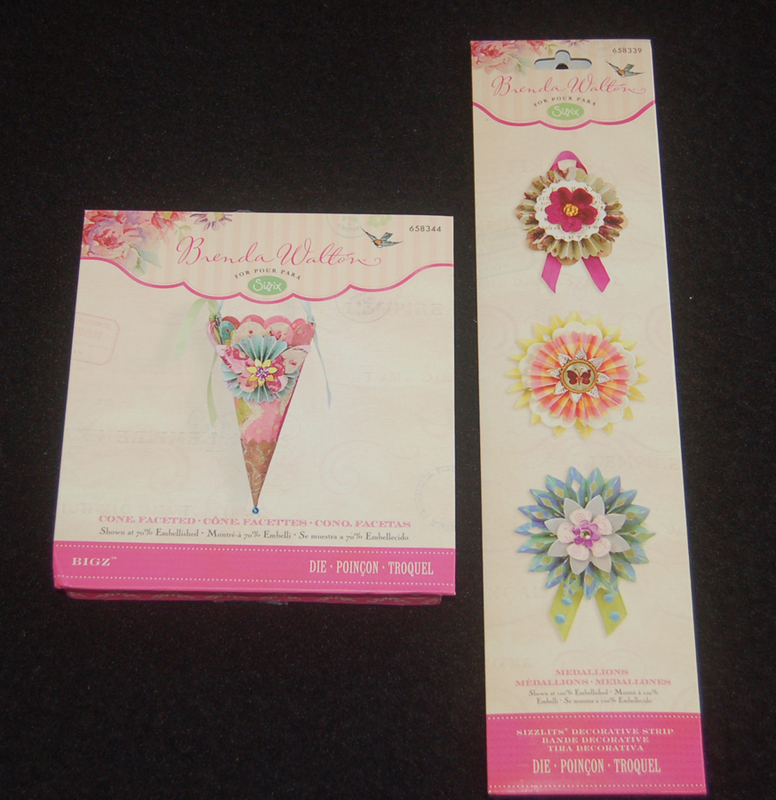 Assembling die cut flowers (the small ones) on glue dots makes using them easy to adhere to any project. Maybe several dots could be stuck together to use for larger blossoms. If you are an indoor flower gardener like me, you really need to invest in a few Sizzix flower dies. Sitting in a comfy chair and making pretty flower embellishments is a very satisfying and relaxing experience, and it uses up paper scraps so it is environmentally friendly too! Okay, armchair gardeners sit down and.create some flowers today....make the world more beautiful! 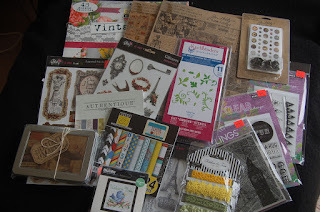 Give me new dies and I'll happily cut through a stash of pretty paper scraps for hours. The result of my playing is the card in the photo above. The photography is not the best (sorry) but you may be able to discern the embossed Sizzix folder design on the blue paper. The buckle die is another Barbara Walton design and cuts a bunch of beautiful buckles in one easy pass. The butterfly/dragonfly die (also Barbara Walton from Ben Franklin Crafts) was used to cut the lavender dragonfly from vellum paper (Stickles and glitter added for sparkle). 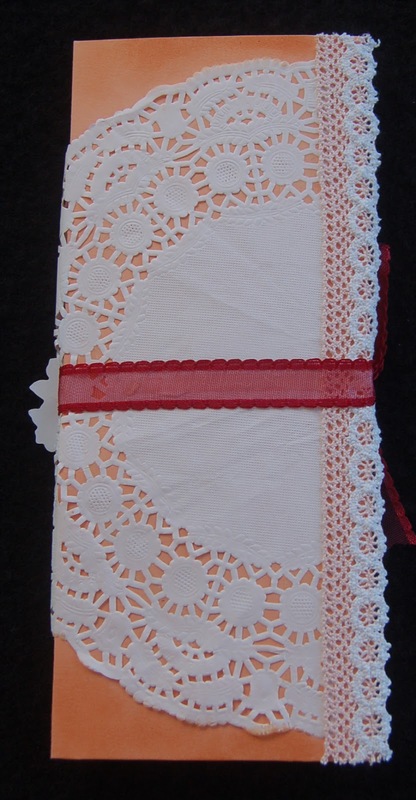 The matching scalloped border was punched out with an EK Success lace punch. Here's a crafting tip: If you save ribbons (like the silk one I used) but don't want to haul out the iron to unwrinkle it, simply moisten it with water and wind it around a small diameter bottle and let it dry there....presto! no more wrinkles. The script words on the card were obtained with a stamp from a Hero Arts clear set. Okay, that's it for today. I'm thinking of you; hoping you are crafting and smiling. I'm smiling because you visited this blog site. Please leave a comment if you have the time to make me smile even more. Whenever I get a new die, i just can't wait to cut up a bunch of shapes....a kid with a new toy! 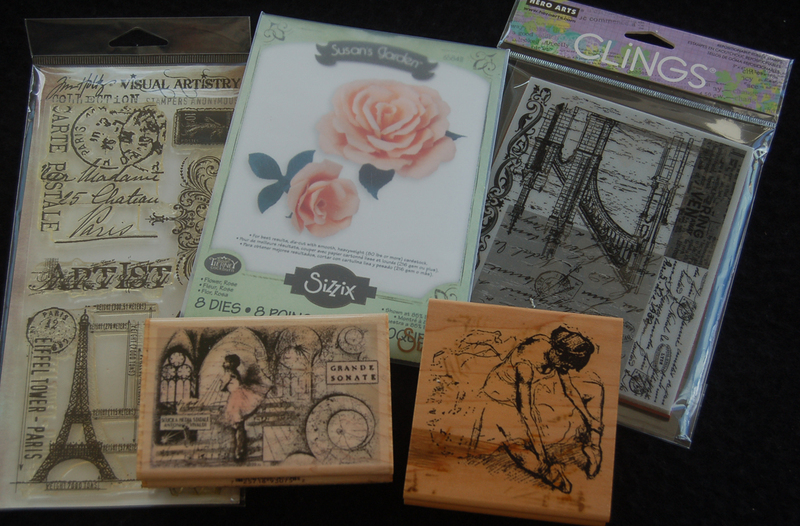 The new Barbara Walton designed Sizzix dies have such beautiful packaging that I couldn't help but pick up a few from Ben Franklin Crafts. Even though the packages didn't have any instructions, the paper die cuts were very easy to assemble using the cover photos. One tip: Use lightweight paper or card stock for the rosettes as thick card stock makes it difficult to accordion fold the piece. Here are the results of just a couple of hours of cutting, taping and gluing. It was lots of fun figuring out color combinations and very satisfying to use up my overflowing box of printed scrap paper. I still haven't figured out what to do with these cones, but most likely they will become favors filled with sweet treats. 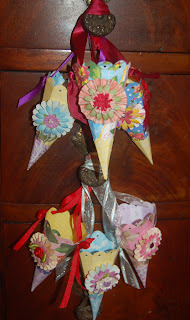 I'm considering using them for gift tags/cards and putting a scrolled message inside the cone. 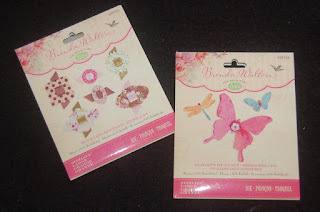 For a paper crafting party they might be wonderful filled with assorted embellishments. Are there any other ideas ideas out there in blogland?